Nikon Vision Co., Ltd., a subsidiary of Nikon Corporation, is pleased to announce the release of the Nikon Laser Rangefinder PROSTAFF 3i — the ideal partner for your outdoor activities. 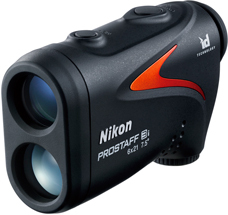 The PROSTAFF 3i employs ID Technology, which displays the horizontal distance in addition to the actual distance. It also boasts a compact, easy-to-hold, ergonomically designed body. One simple press of the POWER ON/Measurement button enables measurement, with the results quickly displayed. What’s more, keeping the button pressed gives you continuous measurement for up to approx. 8 seconds. This is highly effective when measuring the distance to a moving target — with no need to worry about hand movement. The PROSTAFF 3i features a rainproof structure (IPX4 equivalent under our testing conditions), making it ideal for outdoor use without being concerned about changes in the weather. Measurement range: 7.3-590m /8-650 yds. *The specifications of the product may not be achieved depending on the target object's shape, surface texture and nature, and/or weather conditions.